Green Plate Special is abuzz with activity as we prepare for our Fifth Annual Garden Gala on the evening of September 15th. Ticket sales begin on Monday, August 6th. Keep an eye out for Garden Gala emails and social media updates for additional details on event activities and sponsors! If you or your local business would like to contribute to our event’s success, we are still gathering special donations for our “famous” Veggie Pull. 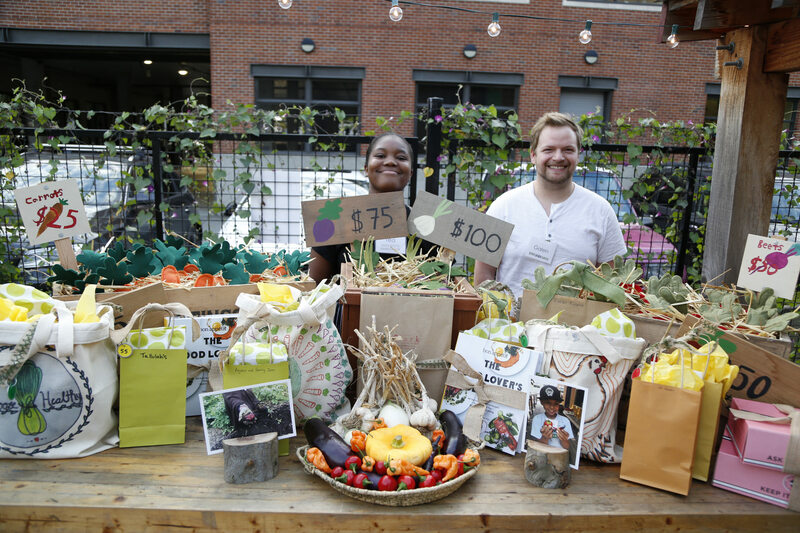 We welcome smaller gifts ($25 – $50 range) for our less expensive veggie pull opportunities. These provide EVERYONE the opportunity to support GPS at their own level. However, $75 and $100 level gifts will always be welcome! Our farm stand (selling only what grows in our quarter-acre garden) is open every Thursday from 11:30am to 4:30pm until August 30th, and is staffed by our talented youth interns. Swing by for a wide array of tomatoes, peppers, squash, figs, cucumbers, and so much more (while they last)! For our enthusiastic 7th and 8th grade youth interns, the Market Stand is their first job training opportunity. They also deepen their previous experiences with GPS and add to their knowledge of food and social justice issues! Please come and introduce yourselves to: Sa’Maiah, Anuja, Annamaria, and Rosario; admire their excellent marketing skills and help them practice their money handling. We are extremely fortunate to work with this year’s three summer adult-interns: Marco, Margaret and Candace (check-out their bios and photos on our blog). Plus, we welcomed our senior youth intern, Sydney Lok. Sydney is a familiar face to those acquainted with Green Plate Special; she was a market stand intern last year and participated in a few years of summer camp before that. This is the second year of this more advanced youth learning opportunity. As a senior intern, some of Sydney’s responsibilities are: mentoring our weekly campers, supporting our adult team in garden and kitchen activities, and sharing her amazing artistic talents with all of us! Alex joined the Green Plate Special team last Wednesday filling a new position for GPS, marketing and communications! Do you sense the excitement and enthusiasm? It’s palpable! She will be heading up our social media, graphic design, community outreach, site updates and so much more. Among her many skills, we understand she can also wield carpentry tools like a pro! You will see her hovering around with her camera at all GPS events and camps. Be sure to say hello and strike a pose. Want to know more about Alex? Check out her bio on our “Team” page! On the Friday before last we bid farewell to our third group of summer campers in traditional GPS fashion: with a lot of pizza (gratuitously topped with at least 3 types of vegetables)! It was an awesome week of egg boats, floral bookmarks, nature journals, harvesting, team building games, chicken egg gathering, and beat-the-heat homemade popsicles. This week we welcome our fourth camp out of seven, and we can’t wait to see what our youth discover and take away next. For More Frequent Updates Check Out Our Social Media!